Directed by Eddie Martin and produced by George Pank and James Gay-Rees, with the backing of Screen Australia, the Adelaide Film Festival, Deluxe Sydney, Hopscotch Films and is being sold by Eone Films and Cinetic Media. 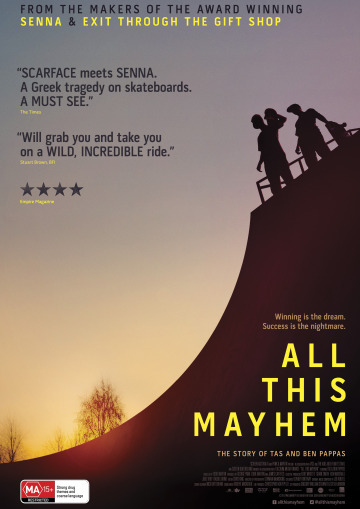 All This Mayhem is a searing account of what happens when raw talent and extreme personalities collide. In this unflinching, never-before-seen account of drugs and the dark side of professional skateboarding, brothers Tas and Ben Pappas’ intense bond and charisma take them from the pinnacle of their sport into a spiralling world of self-destruction. All This Mayhem comes to UK and Ireland cinemas in August 8th 2014.